What are Mudras? How do we define them? As per Eastern philosophies and culture and Yogic practices, 'Mudras' are systematic hand gestures. Literally, Mudra in Sanskrit means a posture/seal More deeply, "closed electrical circuits" of the subtle channels in physical and etheric bodies are also known as 'Mudras'. Some Western writers have defined 'Mudra' as mystic hand gestures used to focus subtle energy, transmit teachings through symbols and confer psychic protection. Chogyam Trungpa says Mudra is "a symbol in the wider sense of gesture or action………Also it is a symbol expressed with the hands to state for oneself and others the quality of different moments of meditation……." The Gherand Sanhita and the Vajrayana Tantra advise that the Mudras are capable of bestowing great powers and psychic abilities called "Siddhies" on their practitioners, hence, their knowledge should not be conveyed to those steeped in sin,to those that are not true to their word, to the skeptics and non believers, to heretics and insincere persons and those who do not observe the precepts. 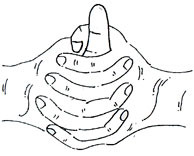 Gyan Mudra : In this position the fingers are held with the tip of the index finger touching the tip of the thumb and the remaining three fingers nearly straight--kind of like an "OK" sign, except the palms of each hand are pointed up or front. Vayu Mudra: This finger position is unbeatable in quickly and effectively removing the accumulated wind in the stomach. Depending on one's physiology, it may take anywhere from 1 minute to 15 minutes or so to effectively expel all accumulated wind in the stomach without the use of anti-flatulants. Mudra should be stopped when the trouble abates. 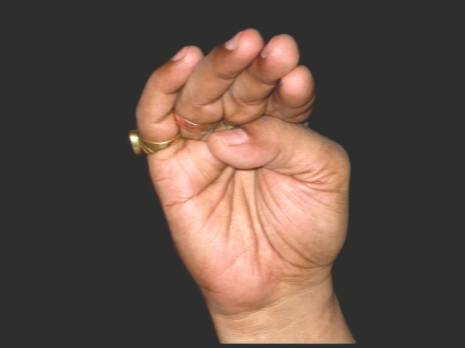 Shunya Mudra : This helps those with impaired hearing. If there is no physical defect, the mudra, if practiced regularly, can restore the hearing power. Remarkably, it helps in getting rid of earaches within minutes. It takes no mare than 2 to 3 minutes to get rid of most earaches. Pran Mudra : This finger position is an all time useful Mudra and can be done for any length of time, any time, any place and will only help in adding to the benefits. This is the mudra which, along with the Apan Mudra, precedes any efforts at higher meditation by the Yogis and saints. The mudra helps to increase the Pran Shakti or the "Life force". It increases one's self confidence. It helps the body in increasing it's vitality and sustenance when deprived of food and water. Shankh Mudra: Tone therapy, speech defects, Indigestion, loss of appetite. Meao Mudra: Excellent in bringing the Blood Pressure to normal from either high or low. 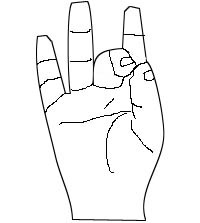 Aatmanjali Mudra: Helps in centering the consciousness of the mind. 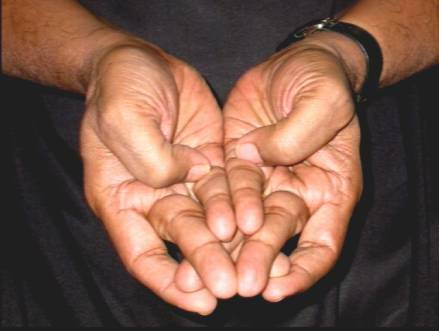 Vayu-Surabhi Mudra A variation of the basic Surabh Mudra, it helps to eliminate all ailments resulting from the increase of wind in the system. In short, Mudras can be our best friends to help us maintain good health and when needed, to help overcome many ailments and diseases effectively and without harm to the body. First give the body a chance to heal itself before giving it invasive medicines and drugs, which must and will have some side effects.